A small, spartan-looking spot, Le Bar à Vin a first-rate wine list and the ingredient-focused cuisine of Paolo Vai, one of Italy’s greatest chefs. 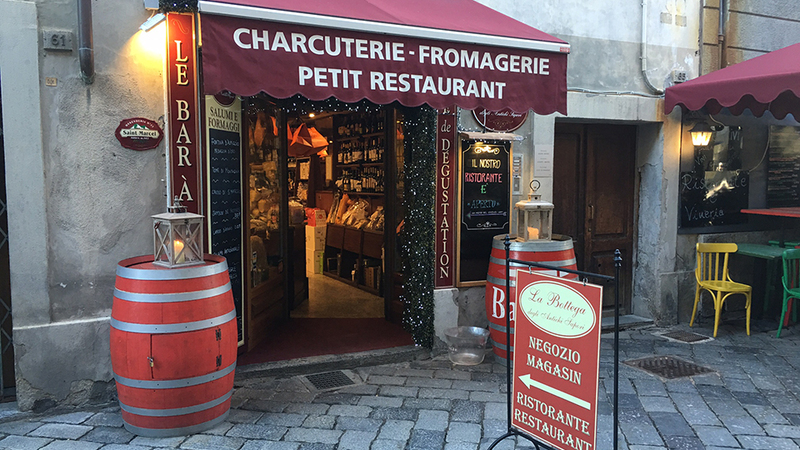 A simple, almost spartan eatery located within the Bottega degli Antichi Sapori, Aosta’s best specialty food shop, Le Bar à Vin is a relatively new addition to the region’s delightful restaurant panorama. 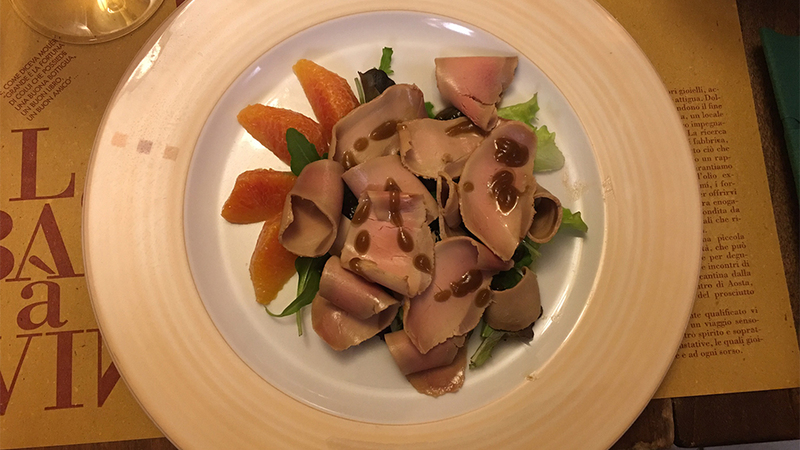 The shop has more than twenty-five years history of gastronomic excellence to fall back on, while the much younger offshoot clearly does not; but what it can boast is its chef, Paolo Vai, truly one of Italy’s great names in food. In the 1970s and 1980s, Paolo and his brother, Enrico, ran the very famous Cavallo Bianco restaurant in Aosta, one of Italy’s best, and recognized amongst foodies of the time as being on a par with other noteworthy dining establishments such as Gualtiero Marchesi’s restaurant in Milan, the San Domenico in Imola, or Guido at Costigliole d’Asti. That historic dining spot closed in the 80s. After a few stints elsewhere, Paolo Vai has now resurfaced at Le Bar à Vin, and we are all the better for it. Vai’s precise cooking rooted in tradition helps elevate this simple eatery into something that is much more than a place in which to have just a quick bite while passing the time. 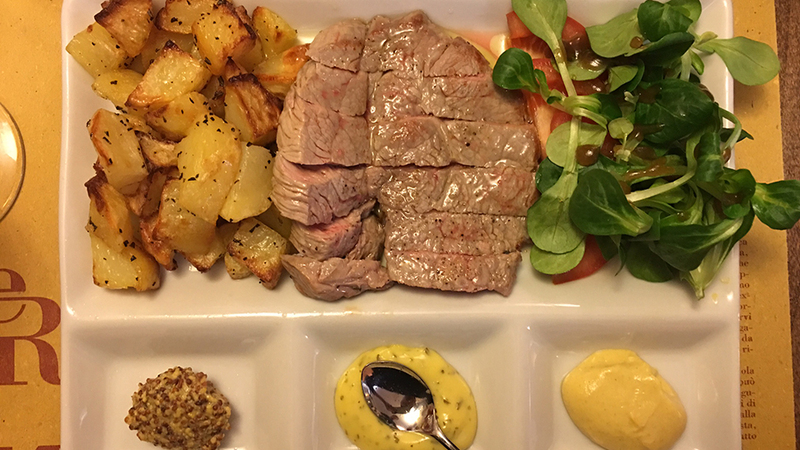 Rather, the food begs for attention, as the carefully sourced ingredients and technical dexterity manifest in their use mean every morsel at Le Bar à Vin has a sense of purpose. A truly outstanding wine selection, not just from the region, but from Italy and the rest of the world too, only adds to Le Bar à Vin’s excitement factor. My most recent lunch was very satisfying, with the cannelloni (an old recipe from the Cavallo Bianco) especially memorable. 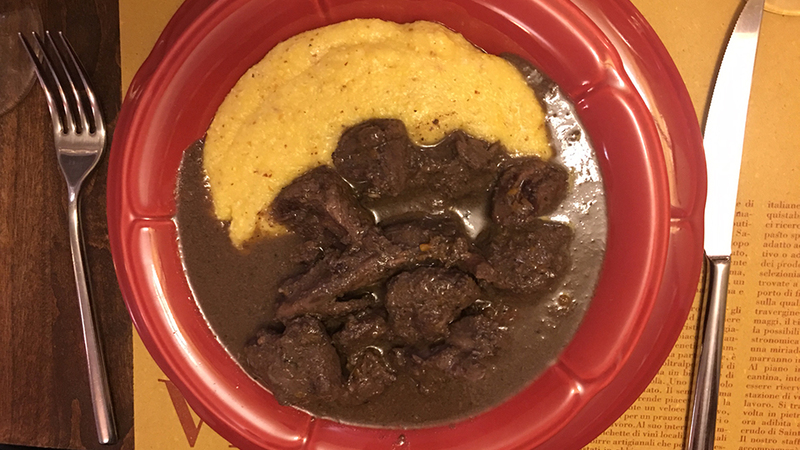 The sliced veal was perfectly cooked (in fact, it was probably the single best veal dish I have had in years) as was the hare (cooked in civet, which means a hearty and very flavorful concoction of red wine, spices and herbs). It appears that a fellow named Rodolpho de Avisius owned vineyards and made wine in Valle D’Aosta’s Enfer area as far back as 1382. So, it follows that the local growers cooperative, CoEnfer, is lucky enough to be working in a historic wine production area of Italy. Its NV CoEnfer Mayolet Metodo Classico Triskell is a lovely sparkling wine made by secondary fermentation in the bottle in the manner of Champagne. The wine is interesting in its own right (lovely and delicate red berry and mountain herbs and spices abound on both the nose and the palate) but it is made even more interesting because it is 100% Mayolet, one of Italy’s least known and yet potentially best red wine grapes – although, its very compact bunch can become a rotfest in years marred by poor weather, so farmers are not too keen to work with it. To the best of my knowledge, this is the only sparkling Mayolet wine I have ever tasted, and the only one made in the Valle D’Aosta currently. 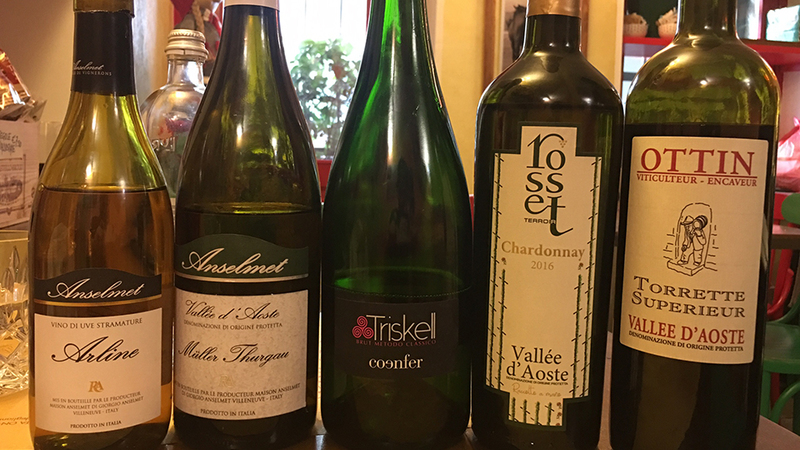 The Valle D’Aosta has always been home to some extremely well made Müller-Thurgau wines and the talented folks at Anselmet have always been especially gifted with the variety. The 2016 Anselmet Müller-Thurgau speaks of high altitudes (Anselmet’s vines are planted at 800-900 meters, or roughly 2800 feet above sea level) with delicate white flower and fresh pomaceous orchard fruit. Not exactly the last word in complexity in this specific vintage, but the wine’s saliva-inducing acidity helps turn it into a lovely companion come aperitif-time. I have a tough time with Italian Chardonnay wines, which are, in the almost totality of cases, poor by world standards. I’m afraid the 2016 Rosset Chardonnay did very little to change my mind. Dilute, thin and tart, it is a disappointing effort. By contrast, the last two wines of the evening are satisfactory: the 2014 Ottin Torrette Superieur and the NV Anselmet Vino da Uve Stramature Arline are both well balanced, very drinkable and food-friendly. The Torrette is made mostly from Petit Rouge, Valle D’Aosta’s most planted red grape, and is redolent of spicy tobacco, flint and red cherry aromas and flavors. The Arline, a blend of 50% Pinot Gris, 30% Moscato Bianco from Chambave and 20% Gewürztraminer, is a late harvest sweet wine that brings a lovely and only apparently simple lunch to a happy close.